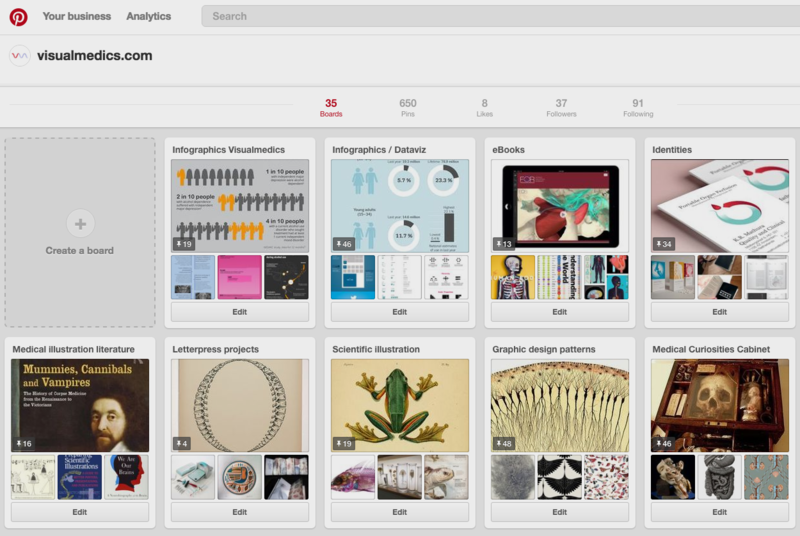 How Pinterest can become a visualisation Studio’s valuable tool for brainstorming, research, and mood boarding. To start with, Pinterest is to me a better alternative to Google image search and to stock images sellers. When searching for either medical illustration, anatomical reference, art, infographics or inspiration, Pinterest has a higher chance of showing results that are relevant to me. While Google search results are based on file names, page ranking and relevancies related to pages reputation, Pinterest shows me users “pinned” results. In other words, the results have already been filtered by users that expressed their liking for certain images. Pinterest has become a clipping file I can reach anywhere, I can also use the description box for taking notes and add information. We, medical illustrators, are very visual, so making tutorials boards seems a great way to find back images online. Another option which I haven’t checked but interested to do soon is to collect pictures and sketches and upload them on the same “sketchbook”. I am often baffled to see how Pinterest makes illustration and infographic mood boarding easy. When sending a mood board to a client, they feel engaged to contribute adding more images to the mood collection. The mood board is always online as a subject reference, it can aid future projects or be shared, or to be turned secret for private reference. Last but not least, I can share all my boards and connect with fellow artists. I do like to share a few of these mood boards to give my contribution to the digital/medical artists. If you have any inputs or suggestions, I’d love to hear from you.